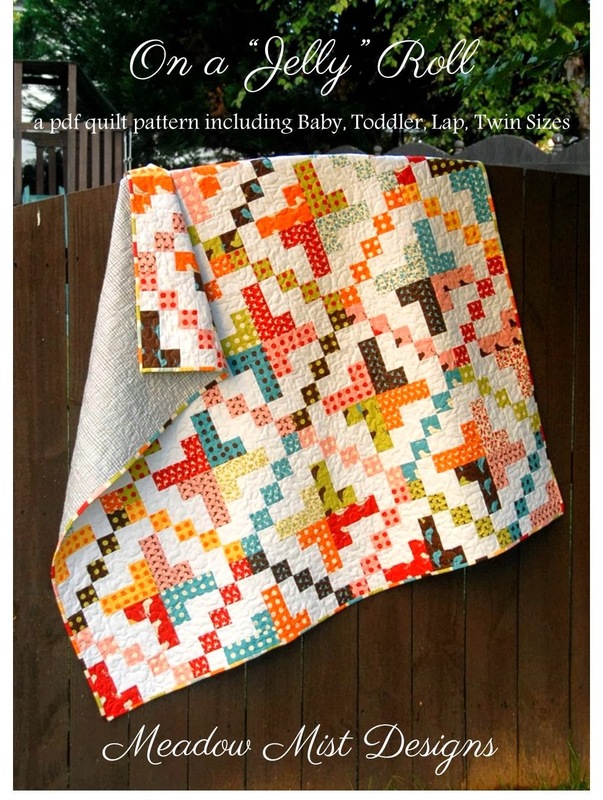 Craftsy Featured Designer and #1 Best Selling Craftsy Quilt Pattern !! I have to share my excitement with you that I am the Craftsy Featured Designer right now! I took a screen shot to immortalize the moment and by the time I had saved the picture went back to the craftsy site my pattern was now #16! Needless to say, I sat at the computer for the next hour refreshing it every minute or so watching my On a "Jelly" Roll move up the charts to #12 until I really had to go to bed. This morning my pattern has been continuing up the chart. 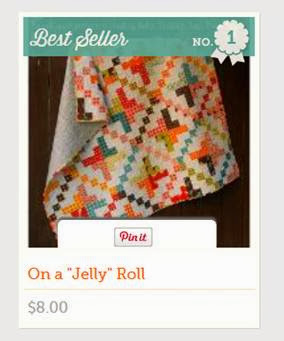 At 10 am it was number 2 and right at 11 am, On a "Jelly" Roll reached the Number 1 Best Seller spot and I was shown as the Craftsy Featured Designer! I hope you are having an excellent, excellent day! It's time for Blogger's Quilt Fest - Fall 2013! The second quilt that I am entering in Amy's Blogger's Quilt Festival is my Pink Broken Herringbon Quilt in the baby quilt division. I pull all sorts of reds and pinks, many from my 5" square scrap pile and set about making some HST. I love how many of the colors of the prints do not "go" with each other, but when all placed together with a scrappy arrangement on a background of white, they all kind of go together. 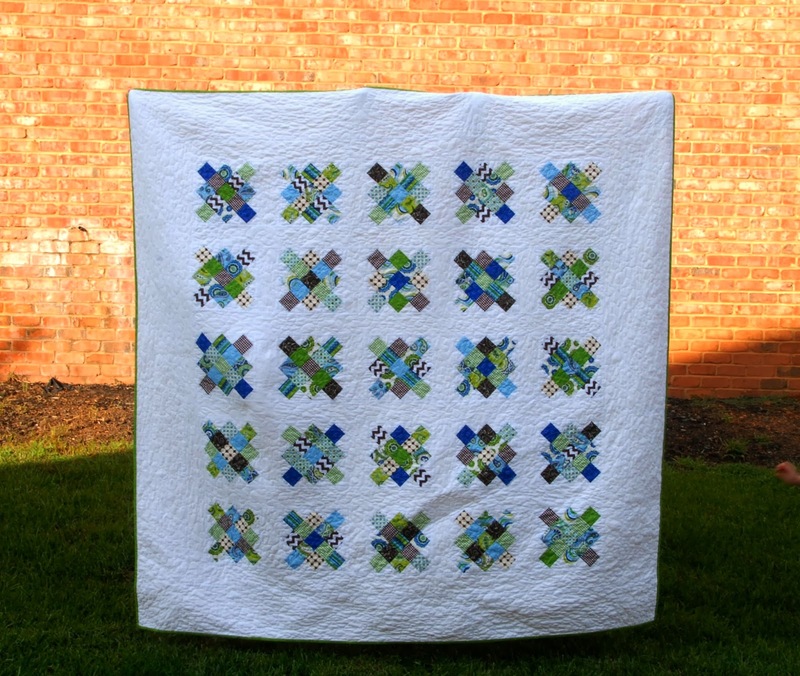 I quilted the broken herringbone quilt using straight lines echoing the vertical, horizontal, and diagonal seams. I used a favorite pink and white stripe fabric for the binding. Quilt Measurements: approx. 40" x 40"
Quilted by…Me on my home machine, my Bernina. 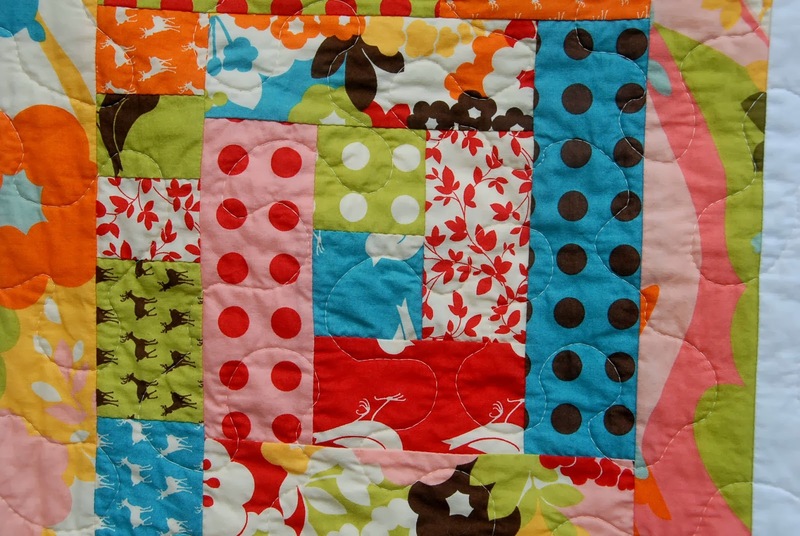 Thank you so much for taking a look at my quilt! 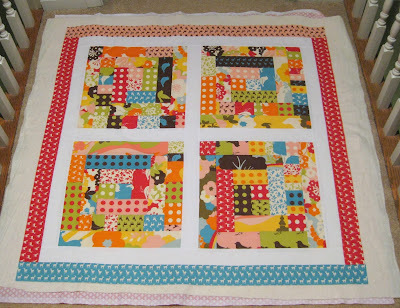 I hope you stay awhile and have a look around the rest of my blog :) My first quilt entry, the Pi Quilt, can be found here. 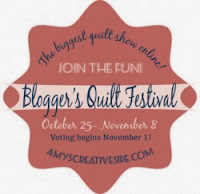 The first quilt that I am entering in Amy's Blogger's Quilt Festival is my Pi Quilt in the lap quilt division. Both my husband and myself are engineers so for his birthday I knew that wanted to make a special math type quilt for him, thus design for the Pi Quilt was born. I wanted to paper piece the numbers and could not find a pattern of numbers I liked so I set off to make my own. 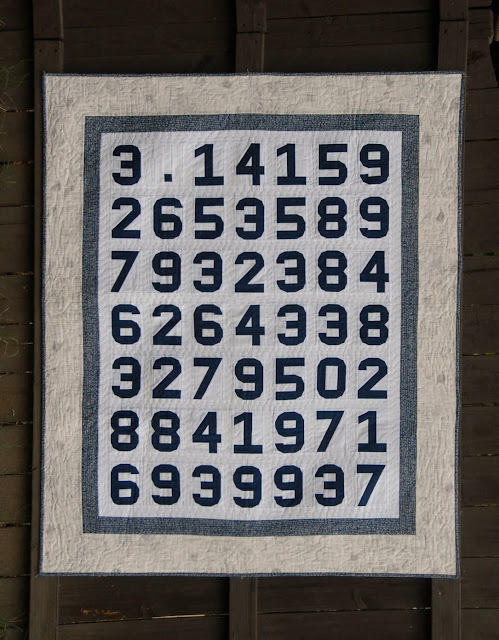 The resultant quilt contains 49 digits of Pi (including the period) with the numbers formed from over 700 individual pieces of fabric (and yes, about half way through I realized how insane this was!) I sashed the numbers in Kona white and added some borders with the Architextures line from Carolyn Friedlander. 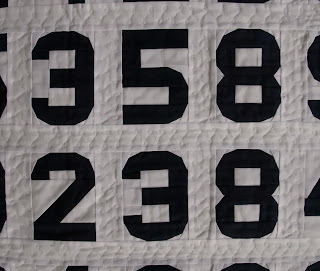 For the quilting, I added a swirled vine pattern to the sashing to make the numbers stand out and a sharp line meandering pattern to the borders. For any other math lovers / nerds / engineers out there (or a quilter with one of those in their lives), I have the pattern for the Pi Quilt listed for free in craftsy. 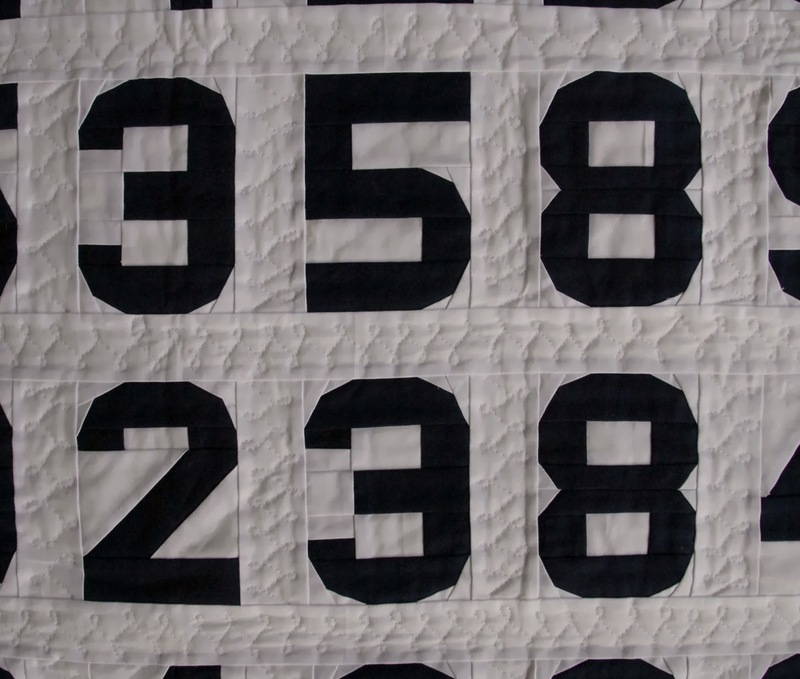 The pattern works with any 3" x 5" numbers, but I also have my paper pieced numbers pattern (including three different sizes of numbers) listed on craftsy and etsy. Quilt Measurements: 51.5" x 61.5"
Quilted by…Me on my home machine, my old Singer. Thank you so much for taking a look at my quilt! 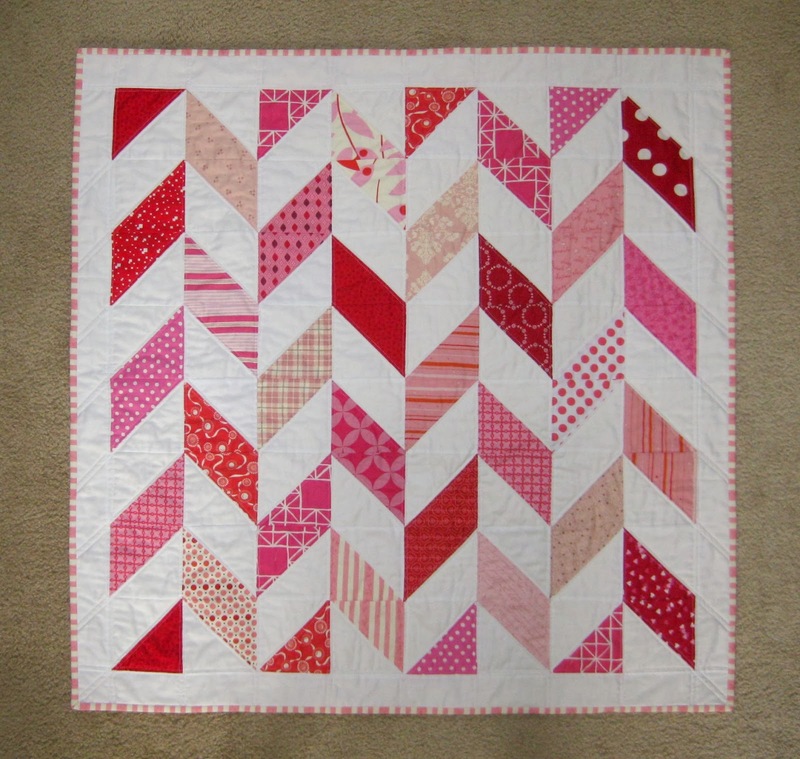 I hope you stay awhile and have a look around the rest of my blog :) My second quilt entry, the Broken Pink Herringbone Quilt, can be found here. 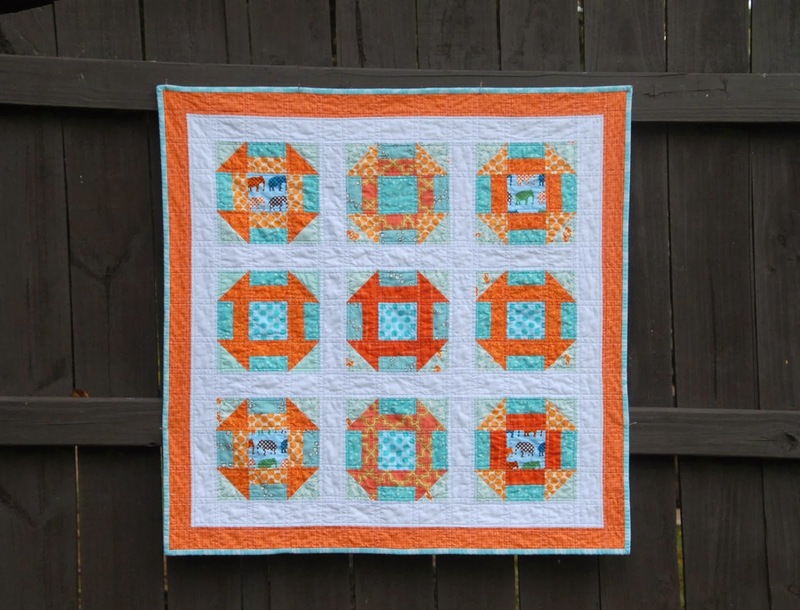 My finish for this Friday is my aqua and orange dash churn quilt. This was my work in progress last Wednesday (Oct 16th) blogged about here. I decided to quilt this quilt echoing the straight lines so that I could try out my new walking foot for my Bernina. It is so much less stressful trying to quilt straight lines with a walking foot and machine that actually work! 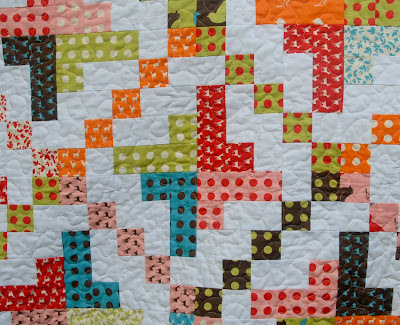 I might be doing more of this straight line quilting even though it does take longer than my favorite meandering. I love the look it gives, it almost makes little "pillows" in the quilt. For the back of the quilt I used an fun gray slightly wonky grid print. 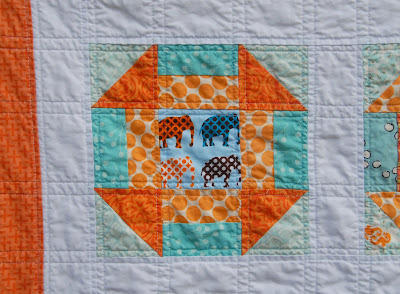 This baby quilt is now listed in my etsy shop. This fall I launched two new patterns, Arrows All Around and On a "Jelly" Roll, started this blog, and reached 100 admirers on etsy so I feel a need to celebrate! How about a special Meadow Mist Designs etsy sale? Please use the code Celebrate from now until November 15th for 20% off everything in the store! Get a jump on your holiday shopping for your loved ones (or yourself). First up, if you look up I actually have a logo! It was designed by Inkblot and I love it. 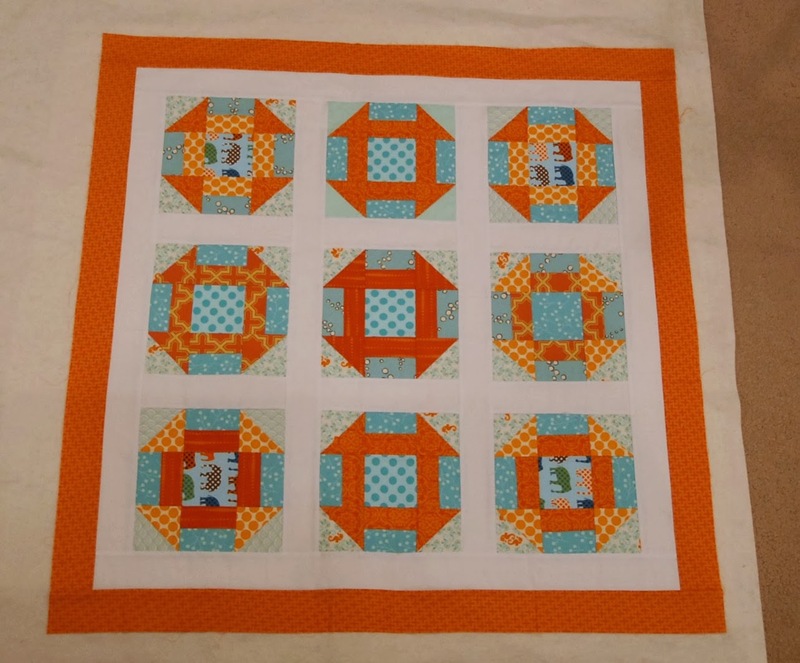 Today I would like to show you a quilt I am making for a friend for use on her dining room table. 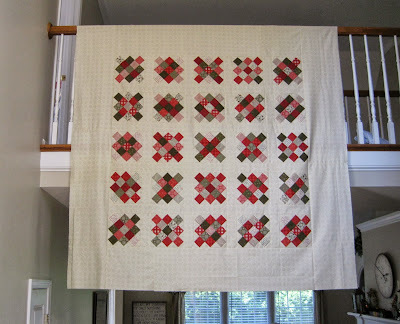 I made a granny square quilt using the red and greens of the Nature's Christmas collection by Sandy Gervais for Moda and added a sashing and border of one of the cream prints. I love how the different arrangements of light and dark fabrics produces such different looking blocks. The plan is to back this quilt with a simple ivory fabric, quilt it using a meandering stitch (I love how it gives quilts that crinkly vintage look) and bind with my favorite print from the line, a bias plaid in red and white. The quilt is 75" x 75" which makes it a little difficult to get a good picture of it. 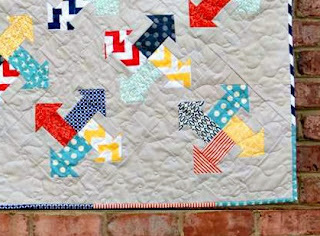 I actually made the same quilt design for the same friend earlier this year using Boho Girl by Insights (shown below). She liked the granny squares so much she choose the same pattern for her Christmas quilt. I usually do not make the same quilt design twice, but it is really kind of cool to see the same design in multiple colorways. I'm linking up with Lee at Freshly Pieced's WIP Wednesday! It was also a little difficult to photograph the fabrics as I was taking the picture under tungsten light at night (a big photography no no) but I figured out how to set my camera to get what I hope are pretty good representations of the colors. 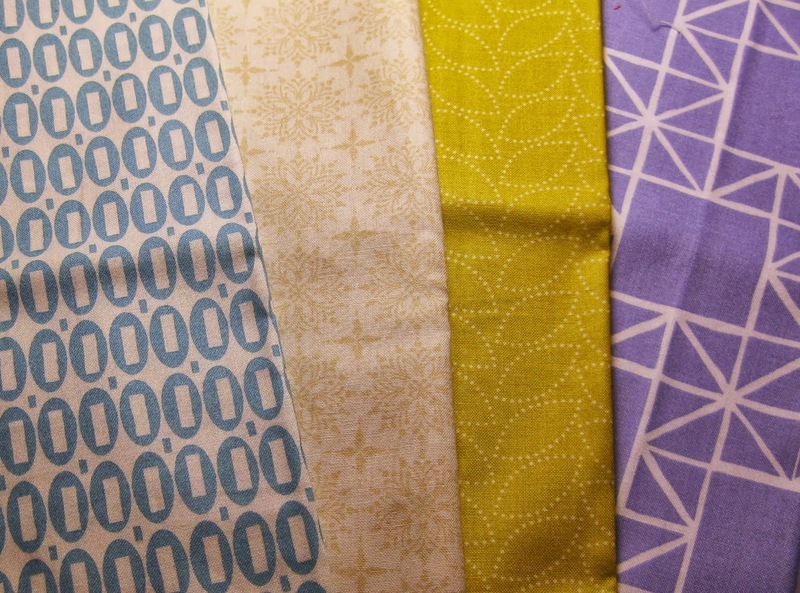 For my fabrics I have some Pezzy, Nature's Christmas, Chicopee, and Quilt Blocks. I just wanted to wrie a short post to share my excitement that I was elected (okay no one else was running or volunteered for the role) as the Vice President of the Greenville Modern Quilt Guild. I am looking forward to working to grow the guild, learn new things, and most importantly make new quilty friends. ** If you live the in the Greenville or upstate part of South Carolina (we also have members from Ashville and Spartanburg) I hope you would consider joining us! I would like to introduce you to Arrows All Around, my sixth pattern. I tried some new things with this quilt, it is my first pattern having the blocks on point and my first quilt using Kona Ash instead of White as the background. I used a bunch of different prints in reds, aquas, blues, and yellows. This was also my Lovely Year of Finishes for October. This quilt pattern can be made using basically any type of pre-cut (charm pack, layer cake, jelly roll, fat quarter, fat eighth, quarter yard cuts) and scraps. The pattern contains detailed instructions and cutting diagrams for each pre-cut size and directions on how to combine various sizes of pre-cuts for the arrows. I had some wonderful woman to help test and review this pattern: Judy, Paige, and Katy. These women definitely improved the pattern and my thanks go out to them. I quilted the quilt in a loopy pattern and backed the quilt with a fun modern sheet I found on sale at Target. The pattern is now available through etsy and craftsy. This was also my "A Lovely Year of Finishes" October goal on Bittersweet Designs blog . 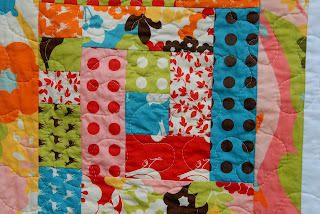 Here is my original linkup (on flickr because it was before I started my blog). Welcome to my second WIP Wednesday. 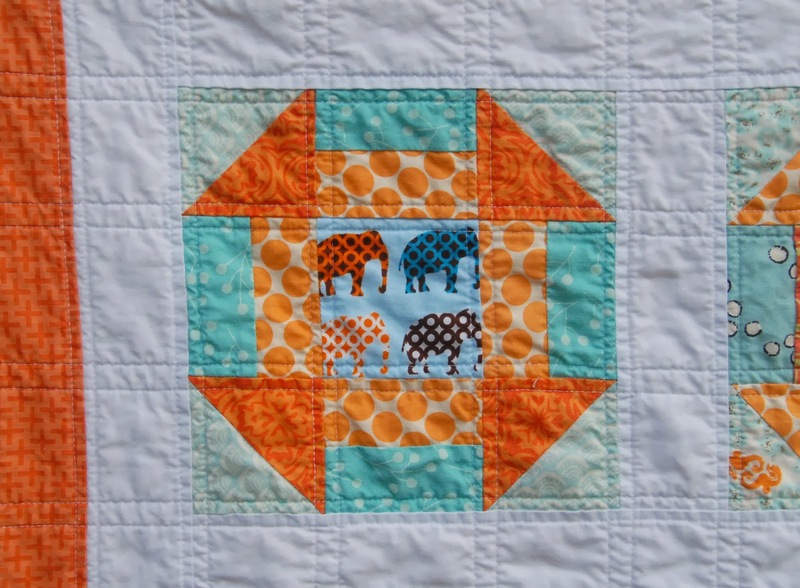 Last week I featured my Oh Deer Baby Log Cabin quilt. I actually finished it a few days ago and you can see it here. 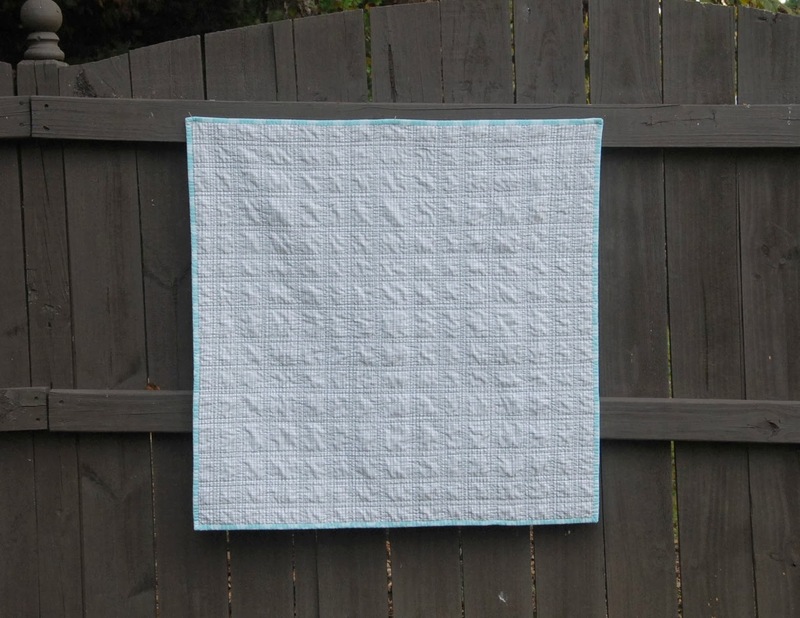 This week I am working on finishing a baby sized dash churn quilt. While I don't tend to have many WIPs, these blocks were made over a year ago as the first dash churn blocks I ever made using some scraps I bought from etsy. I added some white sashing to set them apart and a little border. The quilt top is basted and ready to be quilted (I even have the binding made). The only question remaining is how to quilt it, any ideas? My other WIP is not really a WIP yet as I have not started it yet (does buying the fabric and washing it count?) 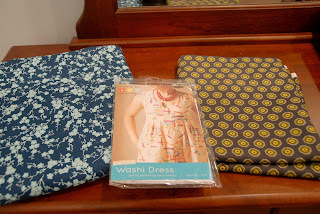 I am going to attempt a Washi dress. As I have only made two dresses so far in my life (both for my daughter) this should be interesting. The fabric on the left is a Joann's fabric that I got for $2.50 a yard so it will be my muslin. 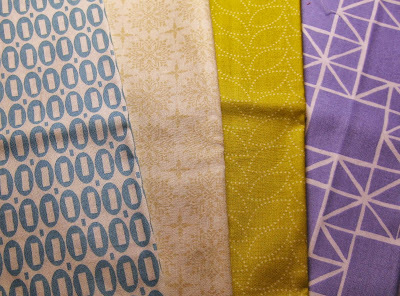 The fabric on the right is a fabric from the Chicopee collection. 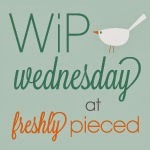 I'm linking up to WIP Wednesday at Freshly Pieced! 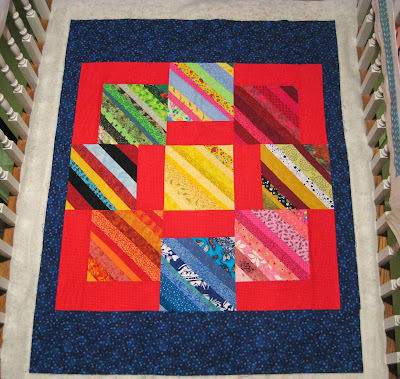 When I was making my On a "Jelly" Roll quilt, I wound up with some very fun and colorful left over strips and scraps that were begging me to play with. I have never make a log cabin quilt so I decided that I would turn all of the fun 2.5" strips into a modern version of log cabin blocks. 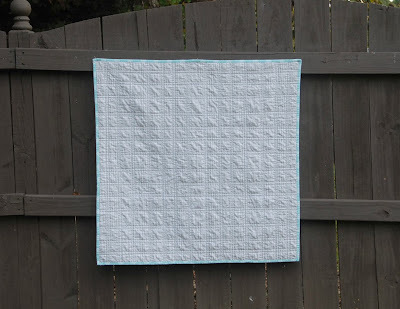 I made 4 blocks larger and larger until I ran out of fabric which was about 15" square. The blocks were so fun and quick to make. I played around with the layout and decided on a little white sashing to make sure that the blocks stood out and added a thin border with some of the deer prints because the deer are so darn cute. I chose to quilt using a meandering pattern because with all of the colors and patterns going on I thought that a simpler quilting pattern might look better. I found a wonderful 100% organic cotton print from the Pop Posies Collection by Nancy Mims for Robert Kaufman on a sale at Pink Castle Fabrics for the backing and I used my usual Warm & Natural batting. I have the quilt listed here in my etsy shop. Thanks for looking! Hi and welcome to my first ever WIP Wednesday post. 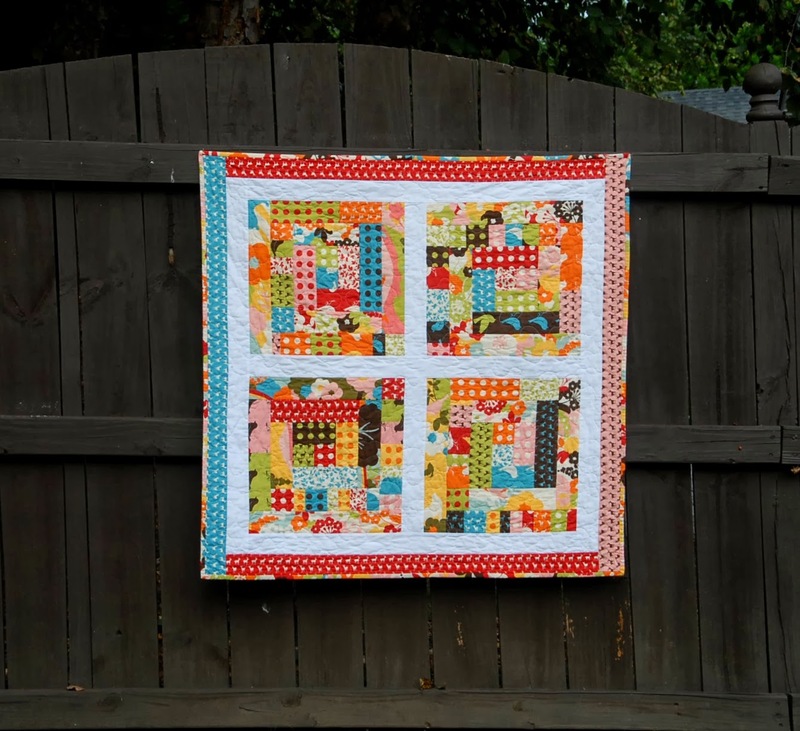 When I first found the online quilting community one of the first link parties I found was the WIP Wednesday linkup. That is how I found most of the wonderful blogs I follow today and I am so excited to join in. 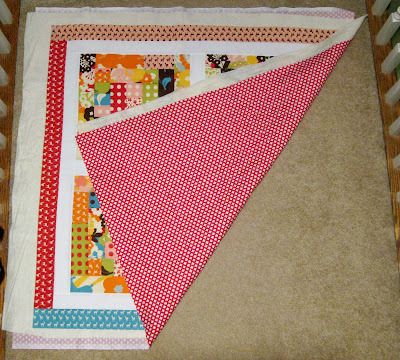 To start I have a baby quilt that is basted and ready to quilt. 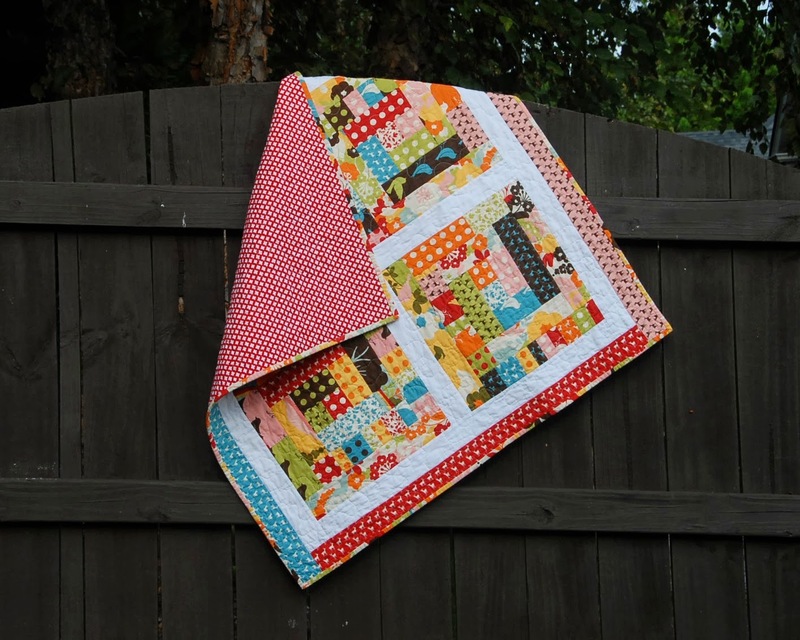 It is a modern log cabin quilt pattern using the Oh Deer line by Momo for Moda. I had never made a log cabin quilt before but loved the pattern, so when I had a whole bunch of leftover jelly roll strips from the On a "Jelly" Roll quilt I knew they should go into making some log cabin blocks. 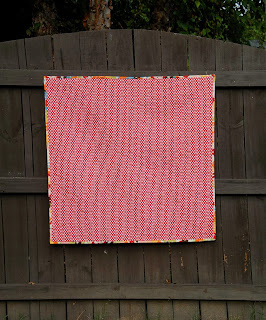 I simply kept sewing strips on (and sewing all of the scraps into more strips) until I had 4 approximately 15" blocks. My second quilt that I am ready to quilt is a charity quilt. 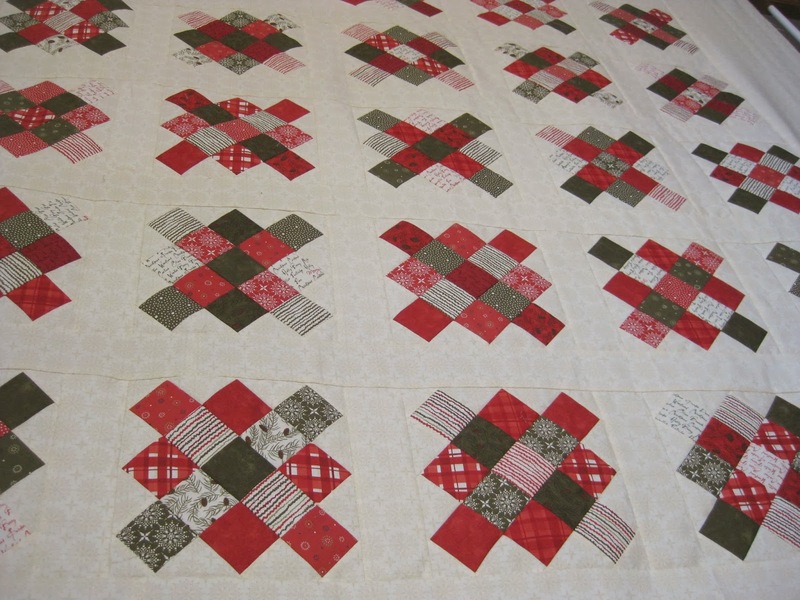 As part of the Foothills Piecemakers Quilt Guild members make blocks, make quilt tops, and/or quilt the quilt. I did not make the quilt top but offered to quilt and bind it. I am going to use this quilt to try out and practice some new FMQ patterns. 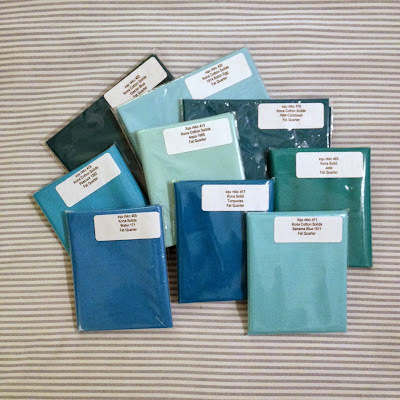 I had the good fortune to win Christa’s Year of Weekly Giveaways #24 – Kona Solids 6 FQ Pack– back at the end of August from Christa's blog. 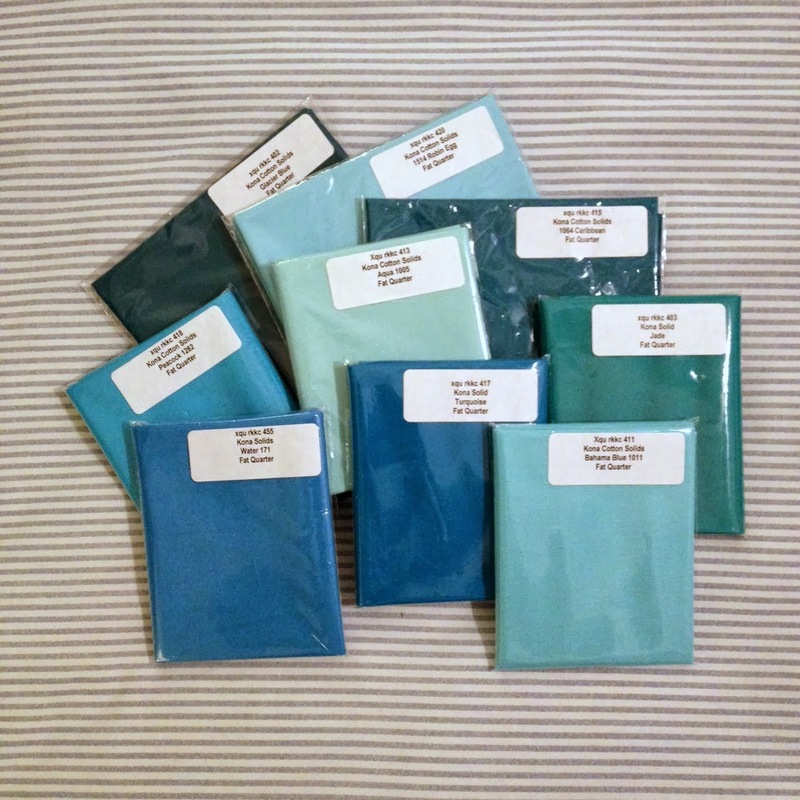 A week ago I finally decided what to get and I wanted to share with you the fabric that arrived. I have ordered from Christa a few times and her service and shipping is always excellent, but what I really wanted to show you was how she packaged each fat quarter. Each has its own little envelope with the Kona color name and style number on it. This is so helpful! I hope you all have an excellent day! **This is not a sponsored post, while I did win some of the fat quarters I paid for the rest myself and am getting no compensation for this post. I just am really happy with Christa's store and wanted to share. 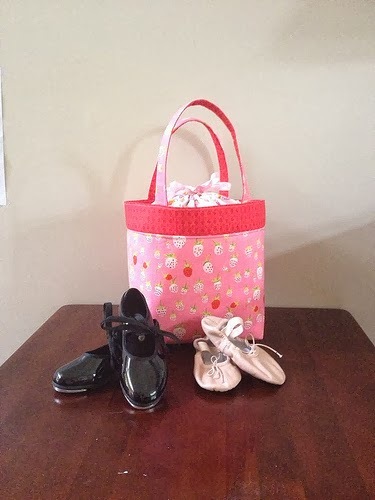 Last month my daughter who is 3 started dance classes taking tap and ballet. Not thinking, we showed up at the first class with her shoes in the plastic bag from the store. All of the other girls had cute little shoe bags. So what is a crafty mom to do? Make her a bag of course. When we got home I allowed her to pick out fabric and because she has such good taste she picked out my brand new Heather Ross strawberries prints (I had not even have the chance to fold it and put it away). 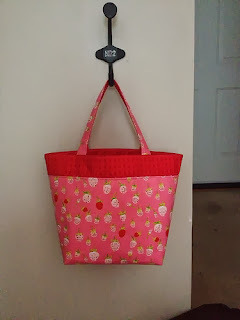 I paired the Heather Ross with a red print from Ruby by Bonnie and Camille. I used Pink Penguin's lunch bag tutorial (because I liked how you could close it so all of the shoes etc would not fall out.). The tutorial can be found here: lunch bag tutorial. 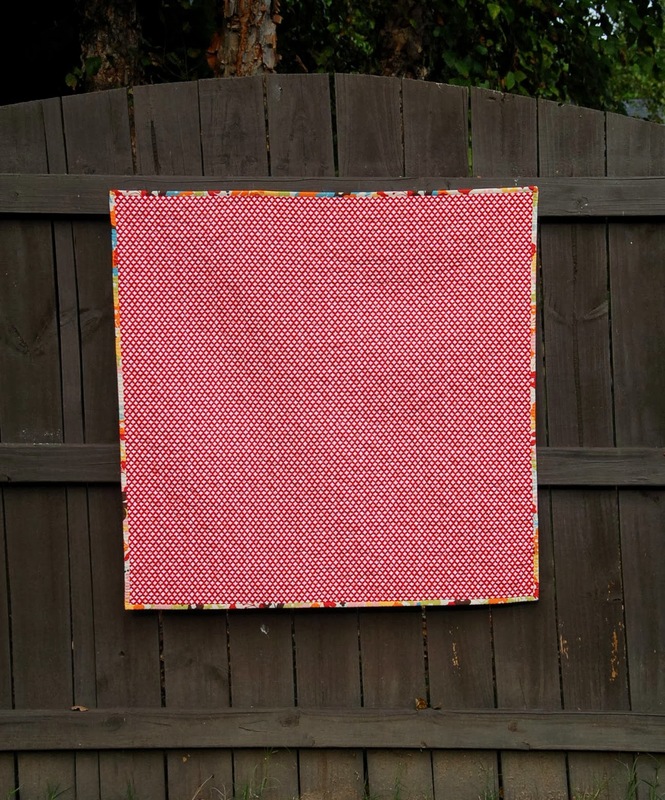 One of the main reasons I decided to start this blog was to connect with other quilts and be able to link up with the fun linky parties going around in blog world. So without further ado...my first link post! This week I have completed my On the "Jelly" Roll quilt and pattern, which is my sixth pattern. I wound up designing this pattern because I got a jelly roll of Oh Deer by Momo for Moda from my parents for Christmas and had no idea what to do with it for over half a year. I came up with this pattern and loved how the blocks when put together for kind of an Irish chain and a star pattern. 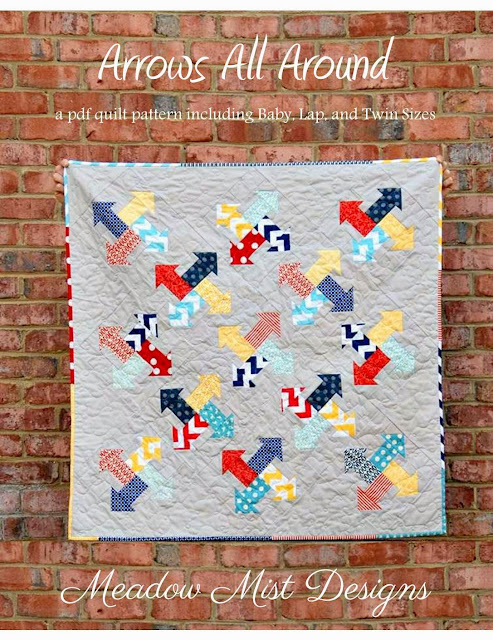 I was going to try to quilt the quilt differently in each section, but I decided that with all of the color and patterns going on in the quilt to use a simple overall meandering pattern. The back of the quilt is a gray cross-hatch pattern that was an on-sale sheet from Target. This is the first time I have used a sheet as the backing and I really liked how it came out (no seams and low price). I did not have any tension or skipped stitch problems. 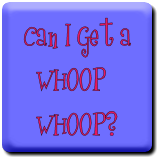 I am linking up to Link a Finish Friday, and Whoop Whoop Friday.